Pow Wow Smith. He was created by writer Gardner Fox, whose recent co-creations included Adam Strange, and artist Gil Kane, who had just finished co-creating Green Lantern. Together, they were responsible for The Atom a couple of years later. Rawhide was a popular new show on TV that year, making people aware of the possibility of finding adventure on the trail while driving herds of cattle to market. DC had already made heroes of characters who spent their time as rodeo performers (Rodeo Rick), teaching school (Johnny Thunder), trying to keep the white men out of their hair (Strong Bow) or just traveling from place to place and doing good (The Wyoming Kid). Trail boss was a good occupation for a new western hero, so Matt Savage was a trail boss. Matt continued as the cover-featured star of Western Comics all the way to its end  which wasn't very long in coming. 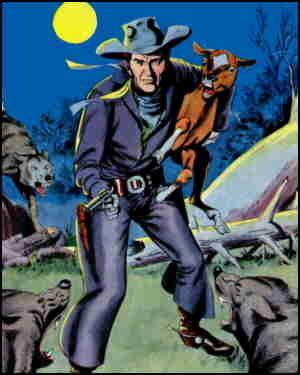 Western Comics lasted until #85 (February, 1961). Fox and Kane handled Matt's stories from beginning to end, with Joe Giella (Mary Worth) inking. Matt may have been obscure and short-lived, but that didn't keep him from future editors strip-mining the company's past in search of old characters to tie new ones to. A couple of decades later, when DC moved Jonah Hex into his own comic, and needed a new star for Weird Western Tales, it created Scalphunter as a white man raised from childhood by Indians. In his first appearance (Weird Western Tales #39, April 1977), Scalphunter is re-united with his dying father, whose name was Matt Savage. Apparently, someone at DC is able to do arithmetic, so the company later established that this Matt Savage isn't the trail boss. But still later, it was counter-established, in the Starman series, that they are indeed father and son. The same source also established that both are related to Lt. Steve Savage, the World War I balloon buster who briefly replaced Johnny Cloud in All American Men of War. Considering how small and interwoven the average comic book universe is, that's not a bit surprising. Text ©2009 Donald D. Markstein. Art © DC Comics.